GS 50a: Sailing in light airs under a Code 0 furling spinnaker. Grand Soleil has launched a new 50 footer designed by Botin and Carkeek, which replaces the company’s previous 50ft offering. Changes from the previous model include a new hull and deck design, with a composite carbon and fibreglass structural frame to spread the keel loads. This replaces the steel frame used in the previous generation of Grand Soleil 50. 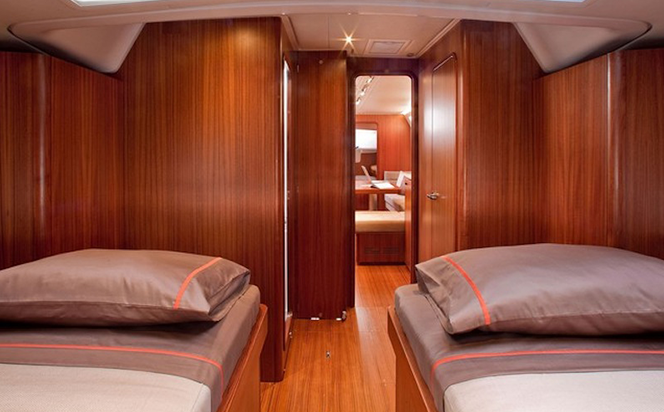 Forecabin: The forecabin can be fitted out with a pair of twin berths, as shown here, or a king size peninsula double. On deck there’s now a much cleaner appearance, with flatter decks, concealed lines and an open transom with a fold-down bathing platform. Under the water is a racing-style keel with an iron fin from which a lead T-bulb is hung. Three different keels are offered – the standard 2.60m draught option, a 2.90m deep fin and a 2.20m shallow draught alternative. There’s also a race version that has around six per cent more sail area. The deck layout is configured to allow for easy handling of the large rig, making this a performance boat that will be enjoyable to sail without risk of frightening guests. There’s good stowage on deck, including a huge sail locker forward that can be fitted out as a skipper’s cabin if required. Saloon: The saloon is unusual in having the galley forward by the main bulkhead, and an excellent navigation station that could easily double as a floating office. Below decks it’s immediately obvious that the arrangement of the main part of the boat is unconventional, with the large galley at the forward end of the saloon, next to the main bulkhead, and a generous navigation station that could easily be used as a floating office abaft of this. A long L-shape settee around a folding table dominates the port side of the saloon. The owner’s suite occupies the whole of the forward part of the boat, ahead of the main bulkhead. A number of configurations are possible here, with all including luxury heads and shower facilities. 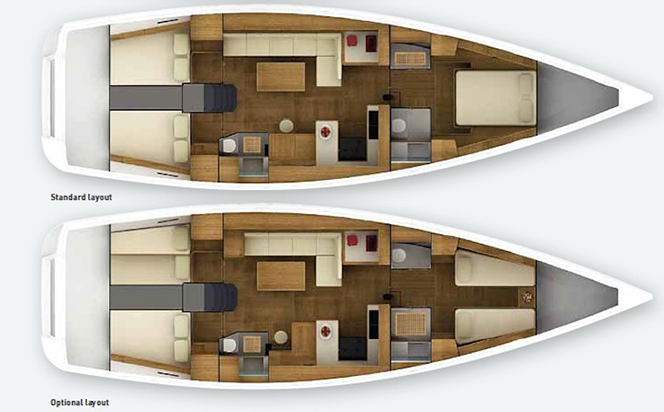 Both the mirror-image aft cabins are of a decent size and have the option of twin berths instead of the standard double.